Your website has a lot to do in order to capture your visitor’s attention… which probably means ‘You Are Losing Money… But you can change that right NOW! Your website visitors have seen hundreds of pages like yours in the past year (or even months or days). They land on your page, and quickly scan… they scan the copy or content you worked so hard on, or spent a great deal of money on, only to leave as nothing grabbed their attention and made them take a closer look. In other words, nothing grabbed their attention so they didn’t read your page or see your call to action… So they didn’t buy anything! You’re not alone… When visitors land on a website that contains movement, the eye is naturally drawn to that element, and engagement increases dramatically… Thus forcing your visitor to take a closer look. As experienced internet marketers with thousands of sales under our belts, we know firsthand the importance of getting someone’s “attention” fast. The reality is you will sell less and less unless you have some sort of visual impact that will draw people into your page, and hold their attention… ANIMATIO does it all in under 3 Minutes! Maybe you’ve tried different WordPress themes and page builders, many with great functionality. And they do the job, however you probably haven’t found anything that provides everything you need to really grab the attention of your visitors. But… You’re Not a Designer or Coder Are You? Most of us are not web designers or coders, so it can be frustrating at times. Changing or setting up new themes is hard work… switching to the latest page builder is a pain. Making changes takes time, know-how…. not to mention the cost. We’ve made it so simple to use that anyone will be able to use it in minutes. It doesn’t matter what theme or page builder you are using… simply add Animatio, visit the page you want to animate. Click the element – Animate and save… that’s it. Animatio does the heavy lifting for you in seconds. There isn’t another plugin on the market that offers the the same or similar animation capability. The More Engaged your potential customers are… the more likely they are to click that link… so you’ll generate More Revenue. From Seasoned Pros to complete ‘Newbies’… Are You Ready? Do you think moving your mouse over a product image and it saying “Get your very own copy of XXXX right now by clicking here” will trigger engagement? There is nothing else like this… No other app offers you this power… There is No other way of doing what ANIMATIO does without changing Page Builders of Themes… and spending time and money. You’ll instantly engage your audience, you’ll boost sales, and gain more lead signups… all from tiny little tweaks which take seconds. Anyone with a WordPress blog or a website can use this attention-getting plugin. It works in all niches so it doesn’t matter what you do, sell or promote online. The use of visual impact, along with your copy, will get your income growing online. It’s so simple but effective. Animatio makes sure that your visitors see a lot more than boring static copy or content… in fact, you are really directing what they see and how they see things. Long Gone Days Of Just Text And Images… It doesn’t work anymore. The new reality is you have just seconds to convince visitors to read more… or they will leave. Animated elements on your page adds visual impact and draws people in…. it engages them and subconsciously forces them to read and purchase more. That’s a huge R.O.I… So would you like to grab your visitor’s attention and Increase your profit on any page? When you are happy with the effect for that element, just click ‘Save’ and now your effect is instantly ready to draw in the attention of your visitors. Everyone knows they have to capture a visitors interest incredibly quickly today. Animatio enables anyone to do just that…… without changing themes, updating or switching page builders. Are you ready to dramatically improve your chances of grabbing your website visitor’s attention, and sky-rocketing your profits… without changing your site, your theme or page builder? That’s exactly what we do… and it works! Set up your first campaign in minutes in any niche you like (remember you can use other people’s YouTube and Vimeo videos). But don’t worry… live links remain dynamic, so you can edit or switch those links at any point in seconds. ANIMATIO is designed to be user friendly… you know that your page always looks different when its live. You often have to make several changes in admin and preview over and over again to see the effect… With ANIMATIO everything is edited in real time on the very page you are looking at. This is especially useful because most people simply scan pages before deciding to read. An animated headline for example will engage… moving elements throughout the page will ensure they read the lot. Normally a new look and new features means a new theme… lots of work, lots of reformatting… correcting messed up pages and posts. Basically changing themes is a pain, it take time (lots of it) and it often costs money. Animatio works with all themes… so you’ll never have to worry about changing to the latest in order to keep people engaged. We all have a page builder we’ve grown to love… and as a result we may have to sacrifice 1 or two cool features included in another page builder such as animation. Or you may find that in order to get those killer animations you need to upgrade… but not with ANIMATIO. Do you use OptimizePress, Instabuilder, Profit Theme?… well the good news is: you can continue to use them. 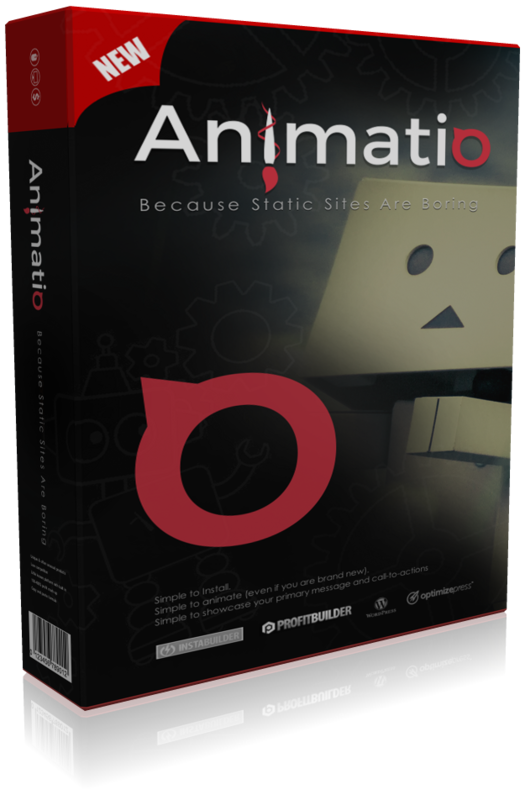 Simply plug ANIMATIO into your page builder and Animate as many pages as you like. You’ll never need to change your website theme or Page builder again. Add Animatio in minutes (the same way you would install any plugin). Add as many voice prompts to your pages as you like… add them to any element. You’ll see what each template says in the drop down menu – 50 to choose from. You have just 6 seconds to grab any visitors attention… without that undivided attention your visitor will leave and as a result you will sell less. ANIMATIO Impacts Optical Flow… I.e. movement and animation forces the subconscious to focus and take a closer look. You worked hard on your sales page… you spend several hours per week adding to you’re blog… you’ve agonised over your landing page & you’ve stocked the best products in your eCom store… But are you making enough profit. If you want to sell more from the websites you already have ANIMATIO will ensure your visitors see exactly what you want them to see… and when you can do this at will, more of your visitors will buy. Install ANIMATIO on all of your websites and watch your sales rise… ready to get started? Animatio solves one of the biggest problems we have is as marketers in keeping people’s attention on our page. You’ve got three to five seconds to get their attention or they’re gone forever… that’s what animatio does and as a WordPress developer I’ve looked at the code it’s beautifully written. I’m convinced. But how much is full access to ANIMATIO going to cost me? Before I mention our ‘Ultra-Low’ introductory one-time license pricing, let me recap on the potential ANIMATIO offers you as a user. Act NOW During our Limited Time Launch Event And Start Using ANIMATIO Today… Order today & you’ll pay just once. And of course…ANIMATIO is 100% guaranteed, if you try our plugin, use it and don’t think it’s one of the coolest apps you’ve ever seen. Just ask us for your money back . . . and we’ll refund your payment.